A tree sitter cuts a rope which one of the arborists, hanging from a crane, is using to pull down a platform. As the battle over UC Berkeley's oak grove near Memorial Stadium continues to unfold, a female tree-sitter has been extracted from the trees after biting an arborist. 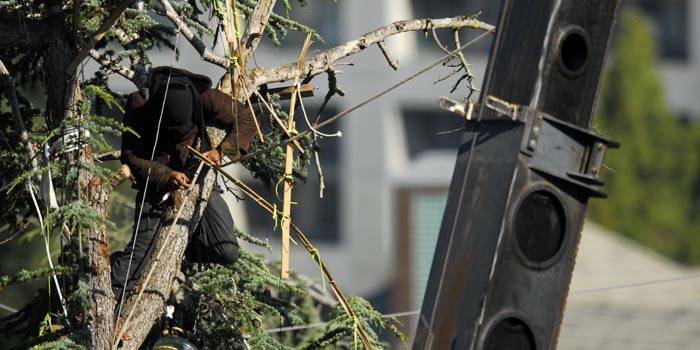 According to Dan Mogulof, UC Berkeley's executive director of public affairs, the woman was on a support line that two arborists were attempting to remove. The woman refused to get off the line after being asked to by the arborists and proceeded to bite one of the arborists in the arm, leading to her extraction from the grove. The arborist received medical attention following the incident. The extraction of the sitter is the latest development in the day-long stand off between UCPD officers and tree-sit supporters that began when UCPD officers and arborists began cutting down tree-sitters's supplies around 6:30 a.m. this morning. Not all of the tree-sit supporters were present at about 7 a.m. when the police erected a makeshift fence, blocking the sidewalk on the east side of Piedmont Avenue and effectively keeping onlookers out of the grove area. As of about 4 p.m., university-hired arborists continued to cut down the tree-sitters' supplies. Berkeley Police officers halted northbound traffic on Piedmont Avenue at about noon while UCPD officers and arborists hoisted in the trees cut off some of the tree-sitters' structures and supplies. The protesters first ascended the trees in December 2006 to protest campus plans to build an athletic center on the site. Mogulof said at a press conference near the grove this morning that police and arborists had planned only to remove supplies today and did not plan to remove any tree-sitters. "We're taking steps to make it difficult for them to sustain occupation of campus property," he said. "How it unfolds depends on the people in the trees...we hope there's an outbreak of common sense." At about 10:45 this morning, unofficial tree-sit spokesperson Ayr broadcasted a call from a tree-sitter at a press conference who gave her take on the event. "(UCPD) have shown no regard for our lives," the tree-sitter said. "They have physically attacked people up in (the) trees ... the university has completely lost their minds." But Mogulof said UCPD has been instructed to go about removing support lines, structures and food as carefully as possible in order to prevent any injuries. Both Mogulof and unofficial protest leader Zachary RunningWolf said that there are between eight and 12 people currently in the trees. Tree-sitters have used bottles of excrement as ammunition against the officers and arborists who are attempting to take down their supplies, amidst yelling from onlookers and other protesters. "These are people who use their own urine as weapons against people who are just trying to keep a college campus safe," Mogulof said. Supporters of the tree-sit who were standing in the street expressed discontent about the way officers are going about the situation, calling their actions "aggressive" and yelling expletives at them. "It's always really emotional and tragic when people who are trying to demonstrate for an important cause are threatened by aggressive law enforcement," send Wendy Kenin, a member of the city's Peace and Justice Commission. Approximately 40 UCPD officers are currently at the scene. Earlier this morning, an arborist harnessed on the end of a crane was lifted onto one of the trees. There, he attempted to cut down a structure in the tree when a tree-sitter began hitting him with a plastic bottle in what Mogulof described as "a direct assault on the arborist." The arborist was pulled out of the tree by the crane, but since then he has continued to cut other structures. Two cherry pickers carrying police officers are also on the site. The officers have cut some of the structures and ropes that the sitters use to travel between trees. Several tree-sit supporters on the ground are yelling at people in passing cars, at one point a group of about 20 protesters stopped a truck which they said they believe is connected to the university, completely stalling north-bound traffic on the street before the Berkeley Police Department blocked off traffic. In response to the campus' move to remove the protesters' supplies from the trees, RunningWolf said he is planning to file a formal complaint against the actions of UCPD officers and arborists at the grove. "You're treating these protesters like criminals," he said. According to RunningWolf, thousands of dollars worth of supplies have been cut down, and he is collecting money to fund a resupply of the tree-sitters from some of the at least 100 onlookers on Piedmont. But some local residents said they think the occupation of the grove has gone on long enough. "I don't think (the tree sitters) are doing it the right way - form a group, go to the government - this just seems silly, wasting your time in the trees," said Ashley Arons, a Berkeley resident. The actions come one day before a lawsuit ruling will determine whether or not the campus can proceed with the construction of the athletic center. Alameda County Superior Court Judge Barbara Miller is expected to issue a ruling in the case tomorrow. Tree-sitter supporters said they were surprised that the university decided to begin the supplies removal today. "We weren't expecting a pre-emptive raid," RunningWolf said. University officials said the decision to begin cutting down supplies this morning was made because they received information that the tree-sitters planned to reinforce their defenses of the trees tonight. Ayr said the tree-sitters and supporters will continue their efforts until the university commits in writing that they will not remove the oaks and until the two fences erected earlier this year are taken down. Should Miller rule in the campus' favor, Mogulof said construction of the athletic center could begin almost immediately. "It's really unfortunate that it's come to this," Mogulof said. "We're doing today what we said we would be doing all along."